NZESOLTeacher: This Months Photo Quiz! Gidday! Welcome to the July photo quiz! Each month there are new photos about New Zealand culture eg nature, food, special days etc. Look at each photo and read the text carefully. You can click each photo to make it bigger. Answer the questions at the end of each section and check your answers. Click the photo to see the preball photo. Popular activities in July include Rugby - watching test matches on TV and playing it, netball, walking and driving in the rain and the ball season has started! (Americans say 'prom'). There are 'after ball' parties too. 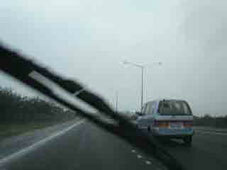 Photo 1 shows a very important part of your car - the windscreen wiper. It rains a lot in July and you need them working well. Rain in the bush is photo 2. Bush means New Zealand forest. 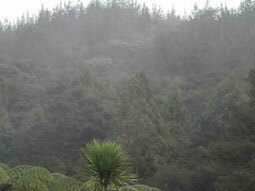 The skyline is pines and the foreground is bush. Photo 3 is beautiful young high school girls off to a ball - a formal dress dance and dinner. 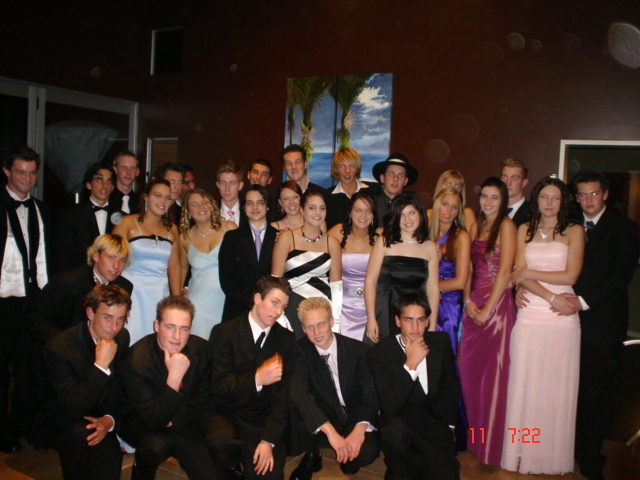 When you click the photo you can see a preball party with a big group of high school girls and boys. 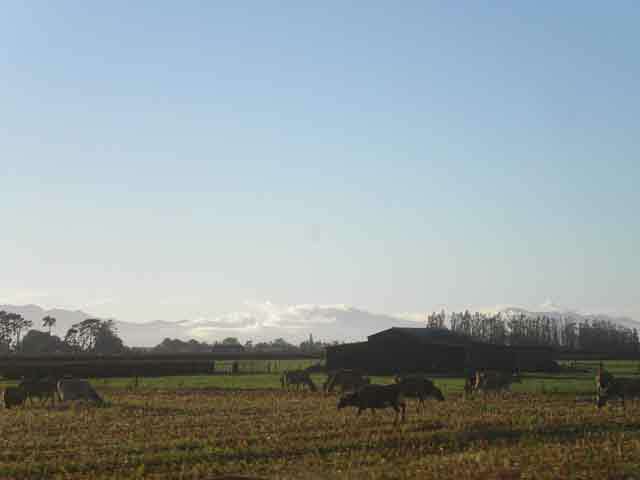 Photo 4 is cows in an old cornfield with fog on the Rumataka Ranges in the distance. There is snow on the top of these mountains. Photo 5: Watch out for 'red light camera ahead' signs because if you speed or 'run a red light' there is an instant fine. Too many people are not stopping at a red traffic light and with greasy winter roads it is very dangerous! 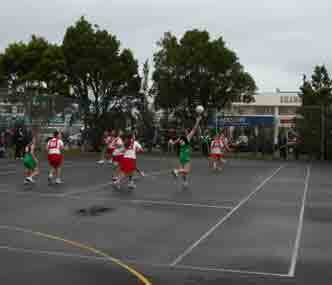 Photos 6: Young boys playing Rugby and young girls playing netball. You plant garlic on the shortest day in June and harvest it on the longest day in December. Spring onions (on the right) and garlic are in season and used in soups and stir fries. 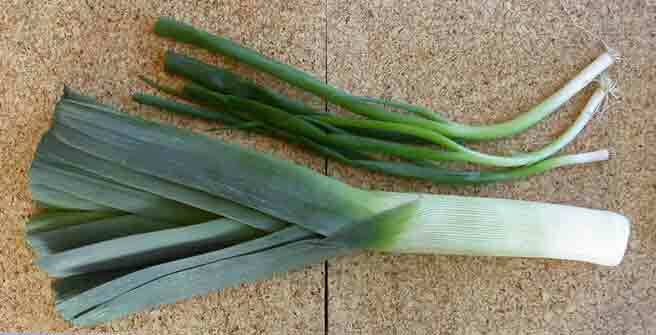 Leeks are larger than spring onions. Photo 9: Kiwifruit. The left ones are green and the right ones are golden kiwifruit (kiwi and zespri are their names in other countries). In New Zealand a kiwi is a famous bird and slang for a New Zealander. The fruit is cheap now, high in vitamin C and great for colds and flu. Things to see and do in July quiz. Try not to look back and read the text or look at the photos before you answer. a) is part of a car. b) moves rain off your windscreen. c) is on your front windscreen. a) are not talking to each other because they have had an argument. b) are going to Mc Donald's. c) are wearing ball dresses. d) are relaxing and drinking a beer. 3. Spring onions are smaller than leeks. 4. The Rumataka Ranges are a line of mountains behind the cows. 5. 'Running a red light' probably means not stopping at a red traffic light and going straight through the intersection.